Cataract means reduced transparency (opacity) of the eye lens that is normally clear. The hereditary cataract (HC) in Australian Shepherds is based on a mutation in the HSF4 gene considered as risk factor. It has been published that dogs carrying the mutation show a 17-fold increased risk to develop cataract compared to dogs free of the mutation. Heterozygous carriers of only one mutated HSF4 gene predominantly suffer from posterior polar subcapsular cataract (PPSC). This form does not necessarily impair vision in the Australian Shepherd breed. 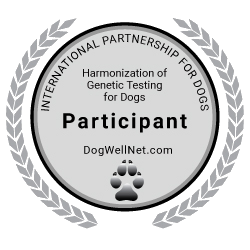 However, dogs homozygous affected by the HSF4 mutation show a more severe progress of the disease. The cataract develops in the nuclear region and may lead to complete blindness. The age of onset is not clearly defined. Current scientific data suggests an autosomal-recessive mode of inheritance with at least one other genetic factor. This defect and the potential genetic factor are still subject of ongoing scientific research.